On 21 November, H.E. 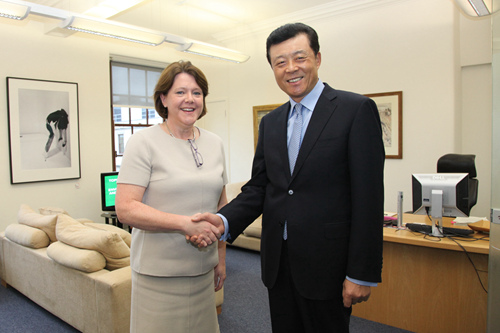 Ambassador Liu Xiaoming met with British Secretary of State for Culture, Media and Sport Maria Miller. The two sides exchanged views on promoting cultural exchanges and cooperation between China and the UK. The Rt Hon Maria Miller MP noted that cultural exchanges are hugely important to UK-China relations. The British side pays a lot of attention to and actively pushes for UK-China cooperation in cultural creative industry. Such cooperation is two-way. She supports the introduction of British culture in China by the British Museum and welcomes Chinese culture and art to come to the UK. She stands ready to have deep discussions with the Chinese side on such topics as promoting the long-tem growth of UK-China cultural exchanges. Ambassador Liu said that the Chinese side attaches great importance to China-UK cultural exchanges. Chinese cultural undertakings are flourishing as never before. After the Sixth Plenum of the 17th Communist Party of China Central Committee established the strategy of strengthening the country through culture, culture was made one of the six main areas to embrace reform by the just-concluded Third Plenum of the 18th CPC Central Committee. Cultural reform will include such key areas as actively fostering the cultural market, promoting the development of cultural industry and upgrading public cultural services. Cultural exchanges and cooperation between China and foreign countries will see greater prospects for further development. China and the UK should seize the opportunities of deeper reforms in China and push for more bilateral cultural exchanges for deeper mutual understanding and friendship between the two peoples.